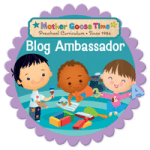 This month we’re starting our Health and Fitness theme with Mother Goose Time. I can see already that there’s a bunch of fun activities planned. 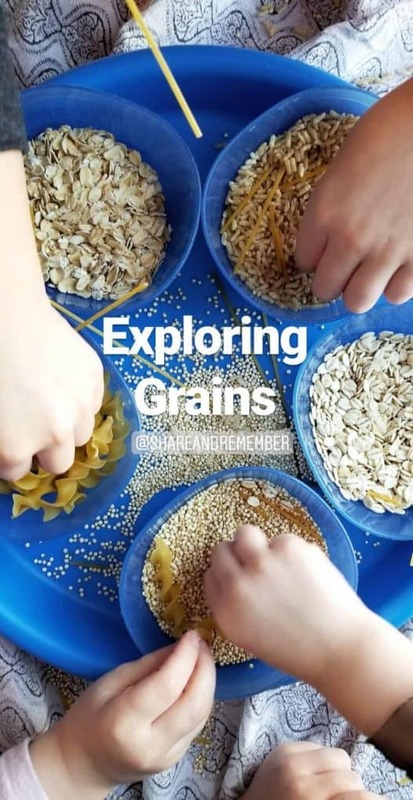 You should see the exploring grains preschool activities we did on day 1! 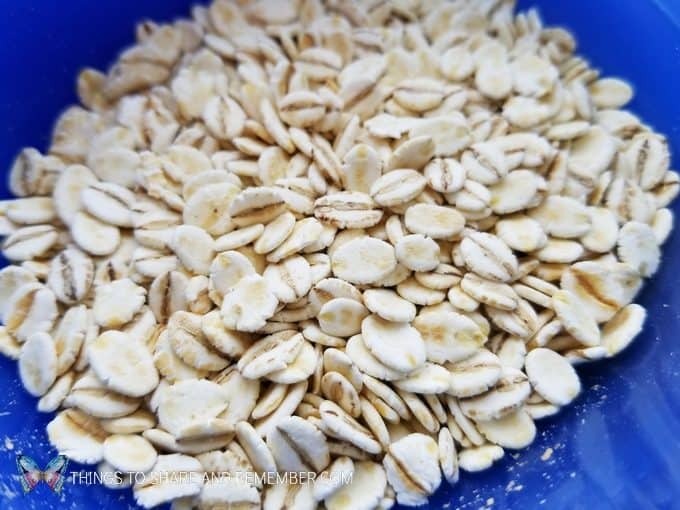 A grain is a seed harvested from a grass plant, like wheat or corn. 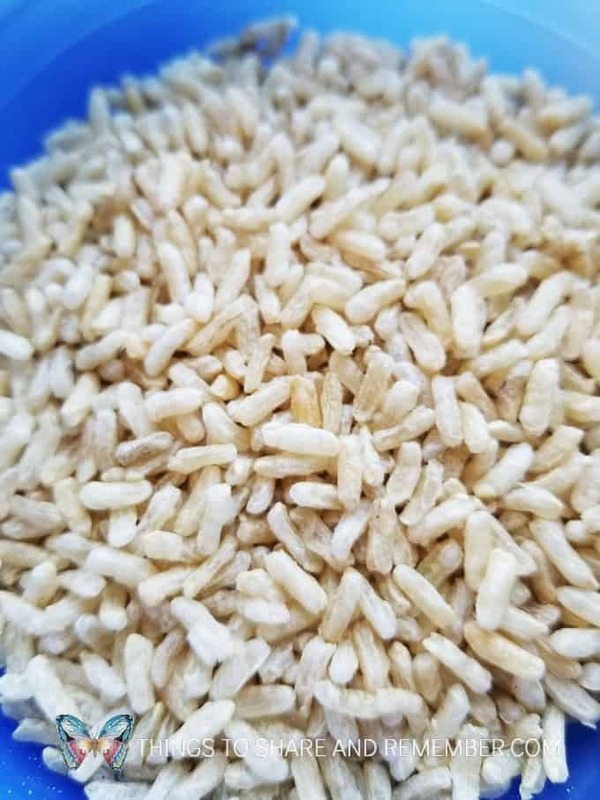 Grains grow all over the world in different types of climates. 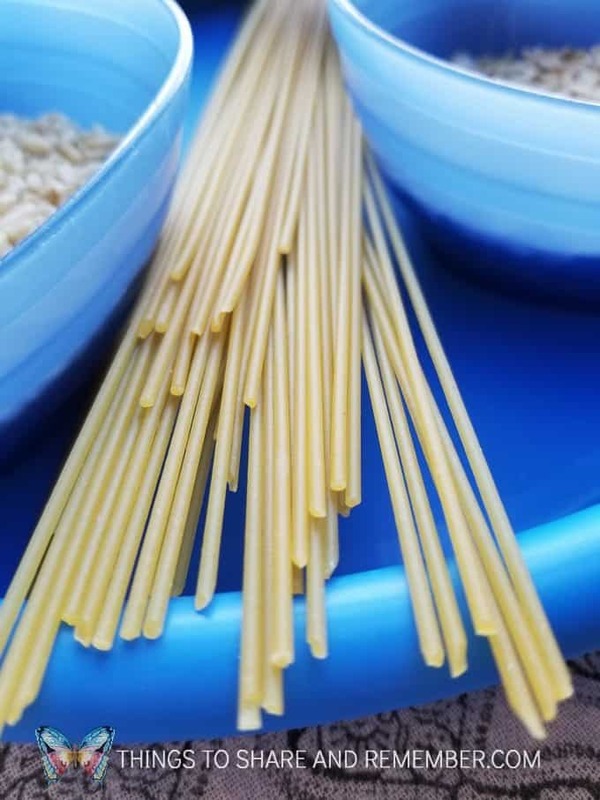 Grains include rice, oats, bread and pasta. 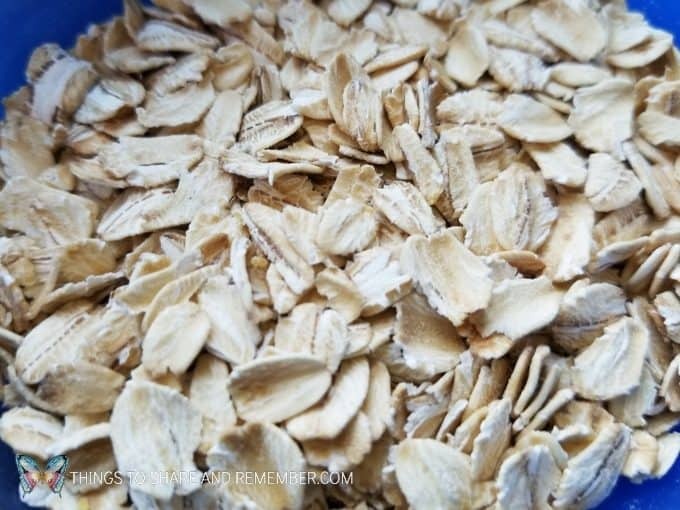 It is important to make sure that at least half the grains eaten are whole grains. The daily recommendation for preschoolers is 3-5 ounces. 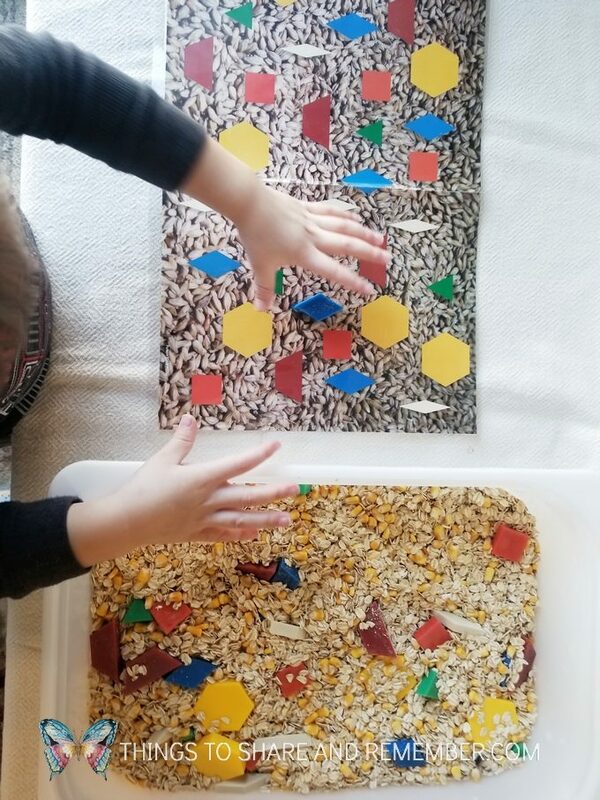 For this sorting and matching Table Top Math and sensory activity, I hide all the pattern blocks in a tub of grains. I used oatmeal and corn. 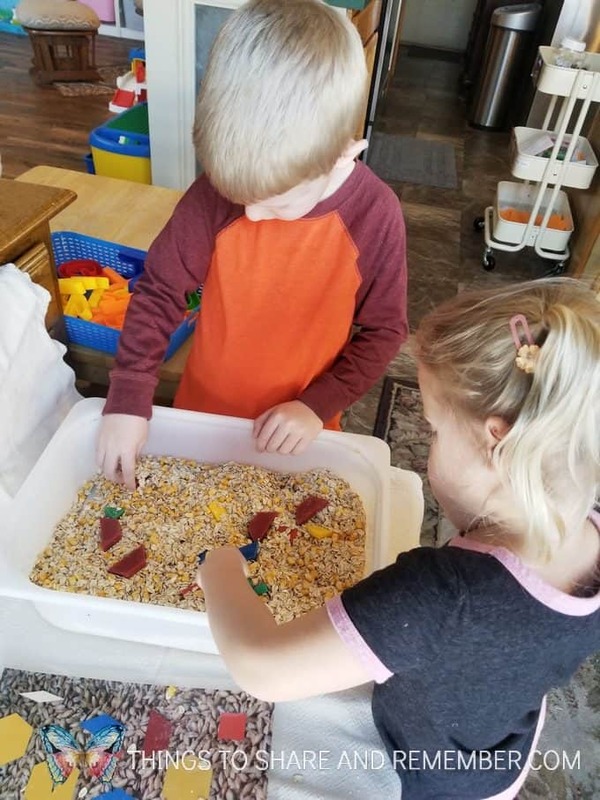 The colorful sensory bin attracted their attention and then the children were soon feeling the grains and sorting out the shapes. 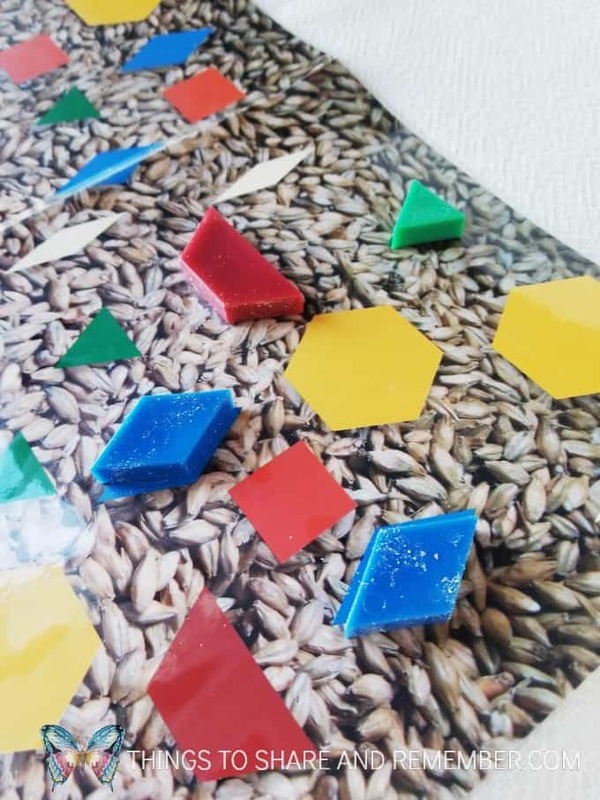 Then they matched the shapes to the pattern block poster. 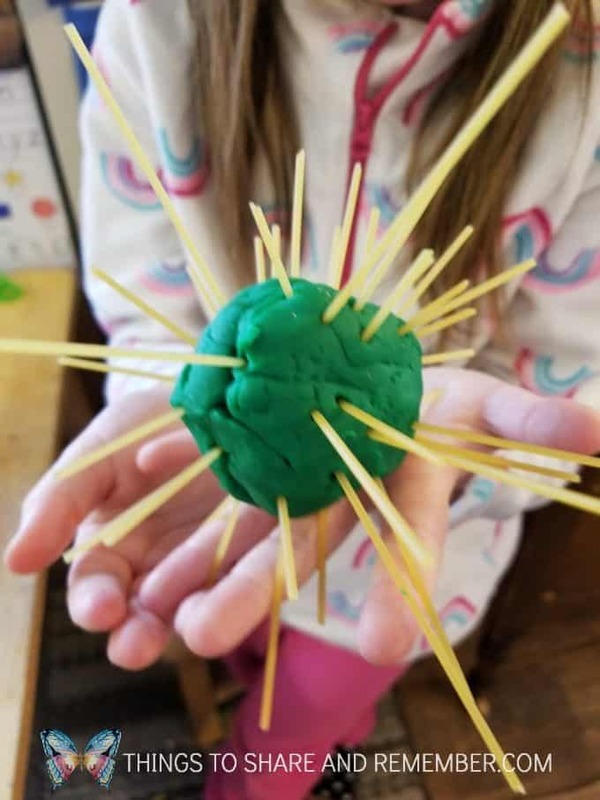 It’s a little messy but I felt it was a very worthwhile mess because it kept their attention for a long period of time, encouraging shape and matching skills. Thankfully oatmeal vacuums up easily! 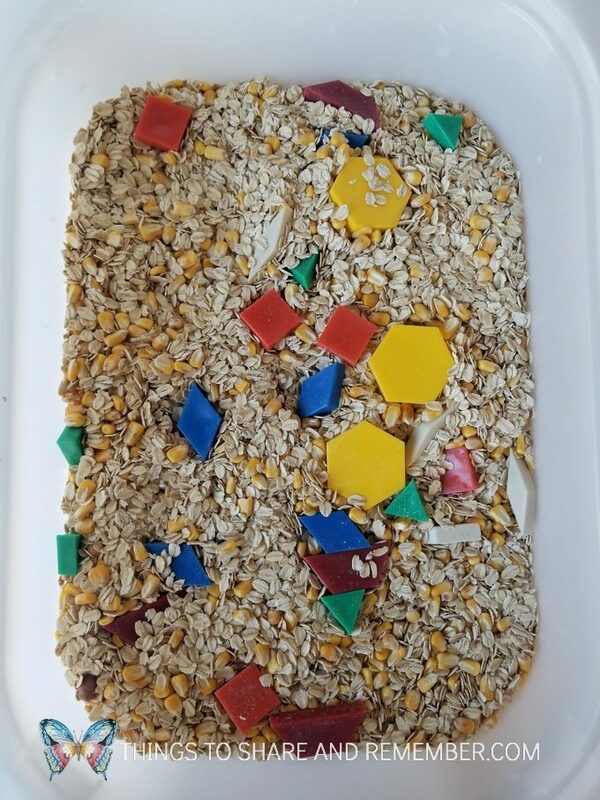 I have a larger sensory bin, currently holding kinetic sand and alphabet molds, but this bin is smaller. I keep it on the counter and put it on the table during free time play for them to explore on and off throughout the week. This way I can have a variety of activities available but keep things under some sort of control. 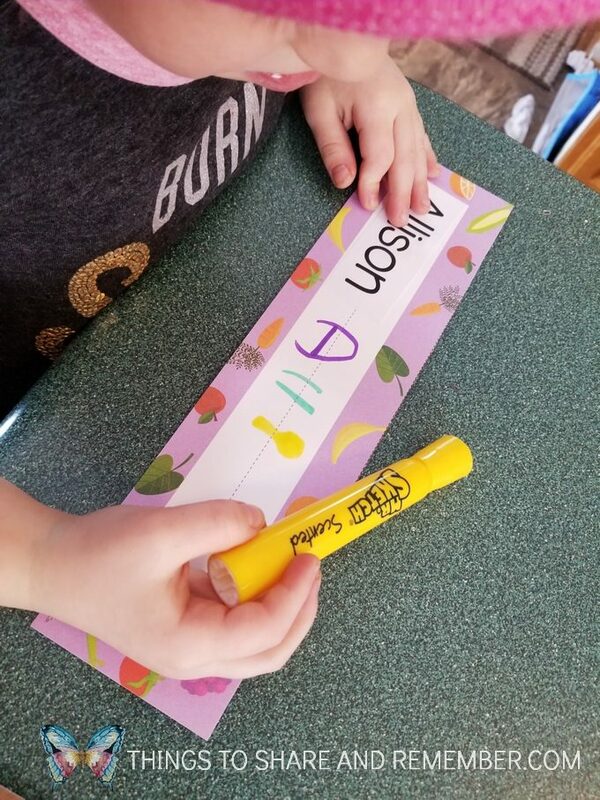 Instead of using the nametags for creating letters, because I felt the letters were a bit small, I printed large letters to explore grains and literacy. 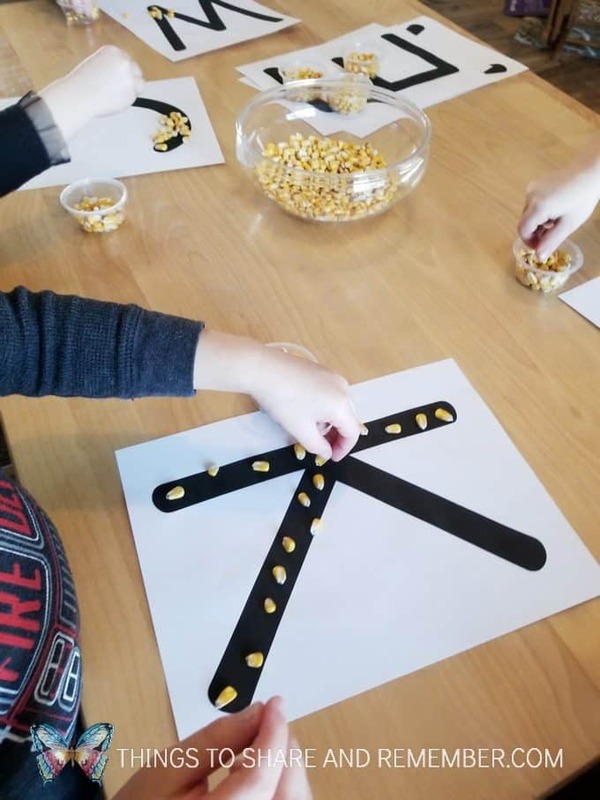 Everyone still practiced writing their name and then transitioned to the table to work on corn letters. 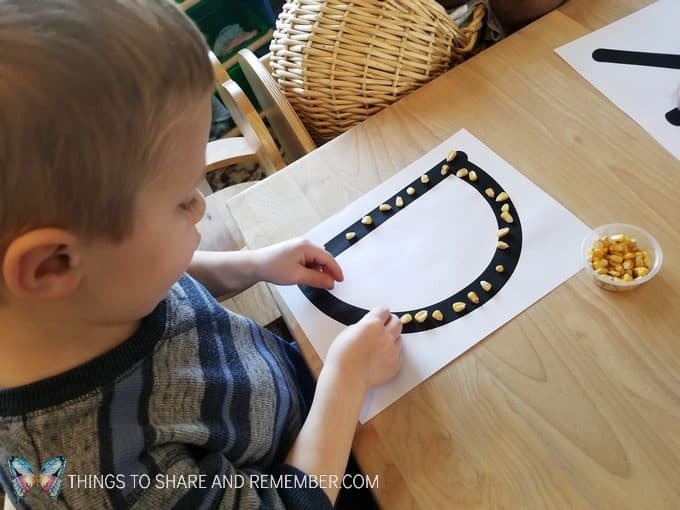 Honestly I wasn’t sure if there would be interest in this activity but they were very engaged in creating their letters! 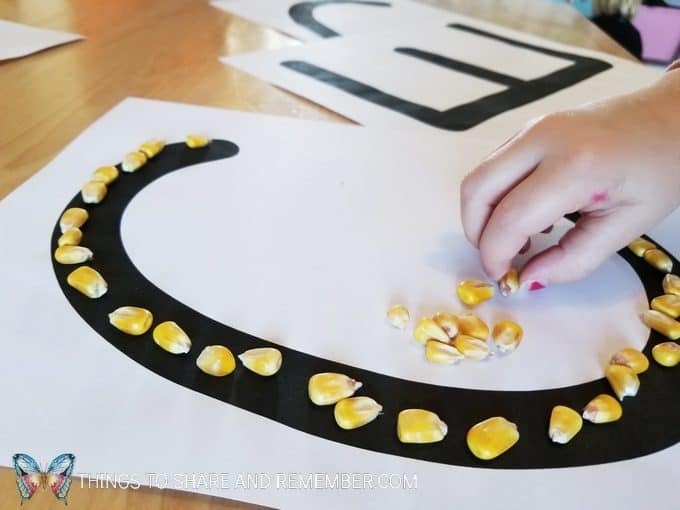 They set to work lining up corn on their special letters. 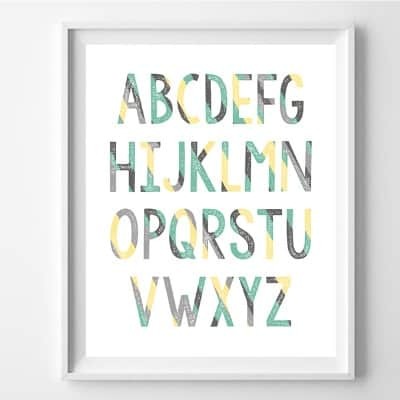 Some asked to trade and work on other letters. 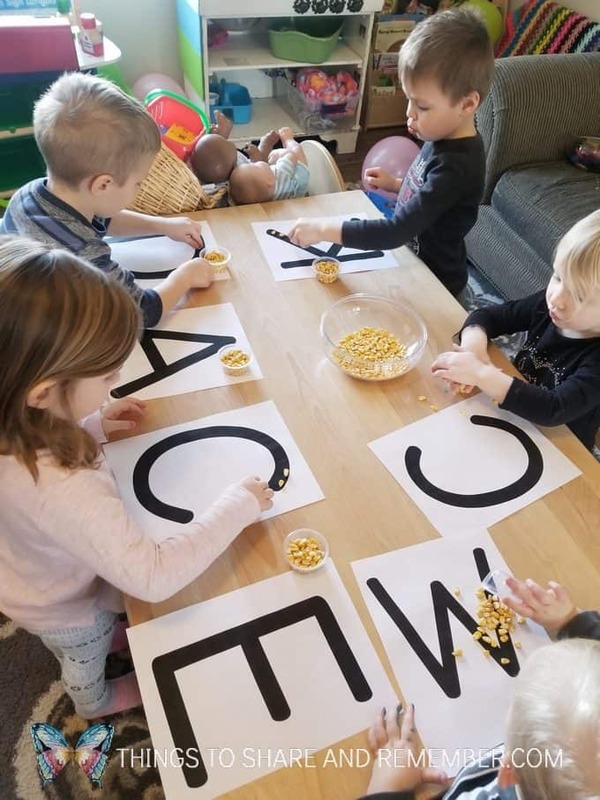 I was pleased to see them excited about creating letters with grains since it was kind of a big job on those large letters. That’s what happens when you provide interesting materials and new experiences. I also like to change things up and work in different places. 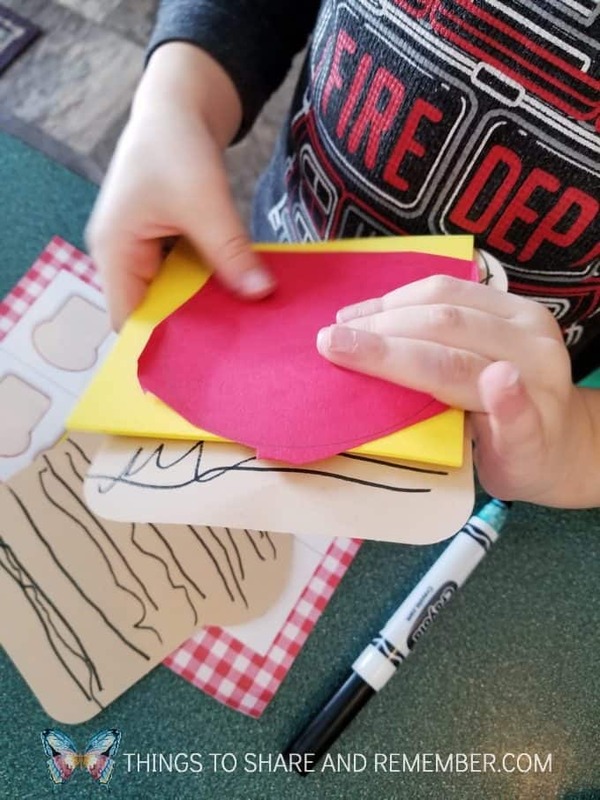 We often do messy work in the kitchen but setting up the materials on the play room table immediately piqued their curiosity. 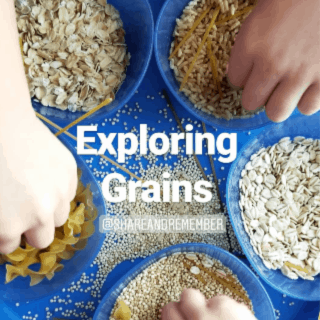 In quickly looking through my pantry, I found some different types of grains to explore. 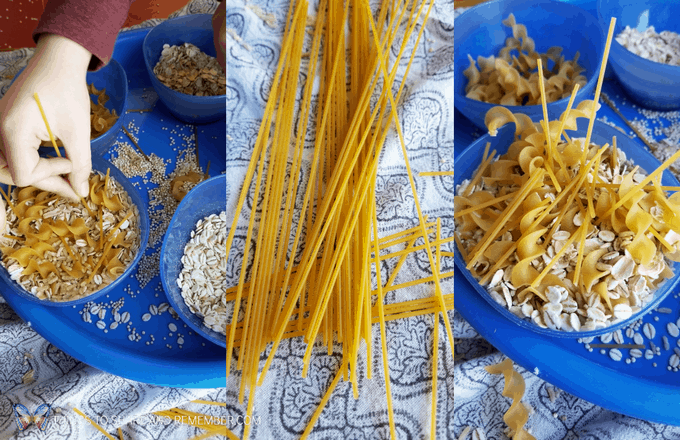 I found quinoa, pasta of all shapes and sizes, barley, brown rice, oatmeal and spaghetti. I have more but this was enough variety for this activity. 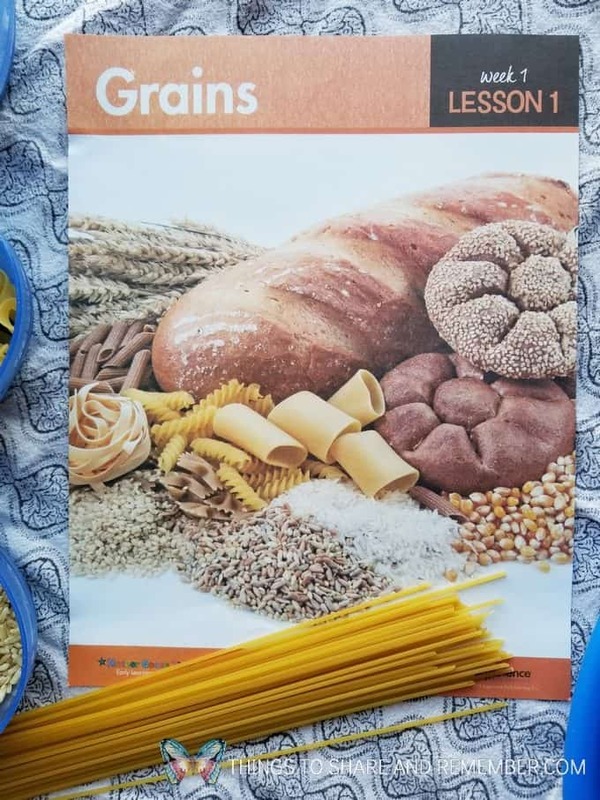 We looked at the grains and tried to guess what they were. Some were easier to identify than others. 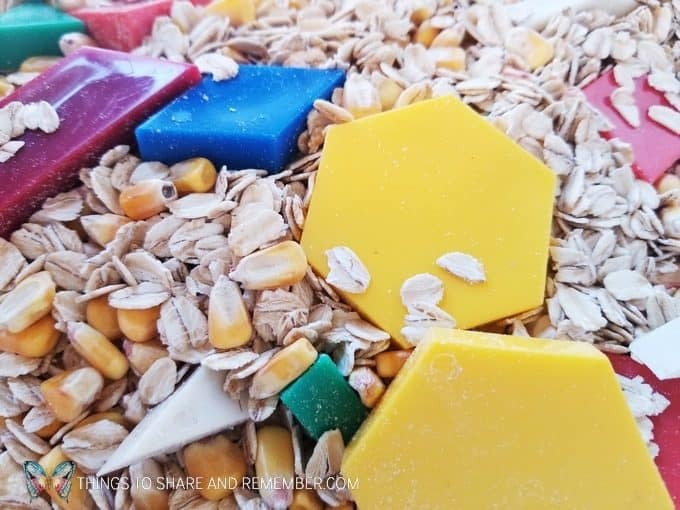 Then they touched, mixed and played with the containers of grain, making cakes. 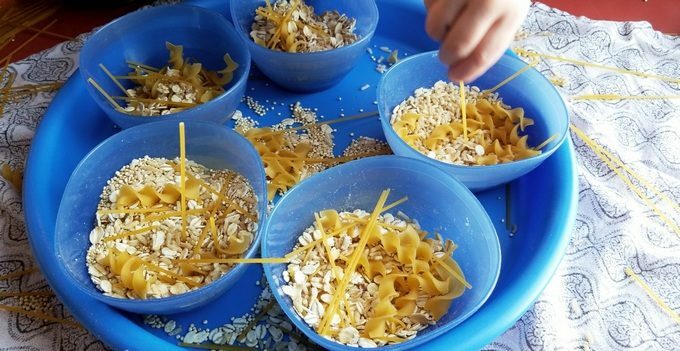 Spaghetti was especially fun to break into pieces. 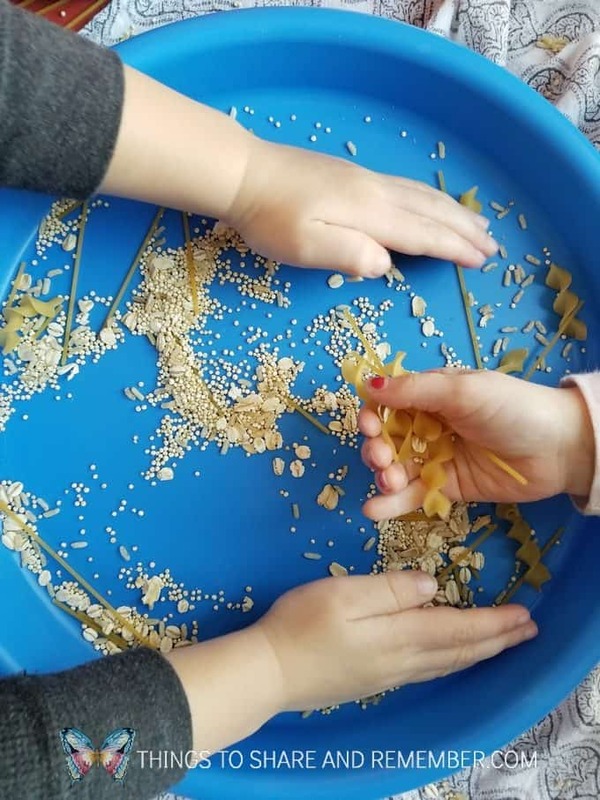 We noticed that barley and oatmeal look very similar. I treasure these little interactions when I stop long enough to really listen! A lesson for me too. 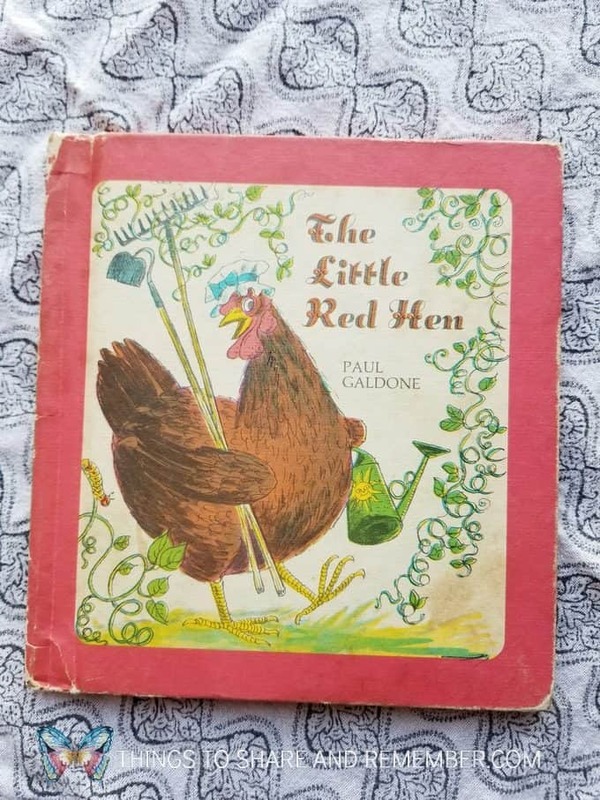 I have an old copy of the Little Red Hen but I just love it. It’s actually from 1973, a year before I was born. I like the old pictures. Although is is an old story, my kids are always so engaged listening to it. 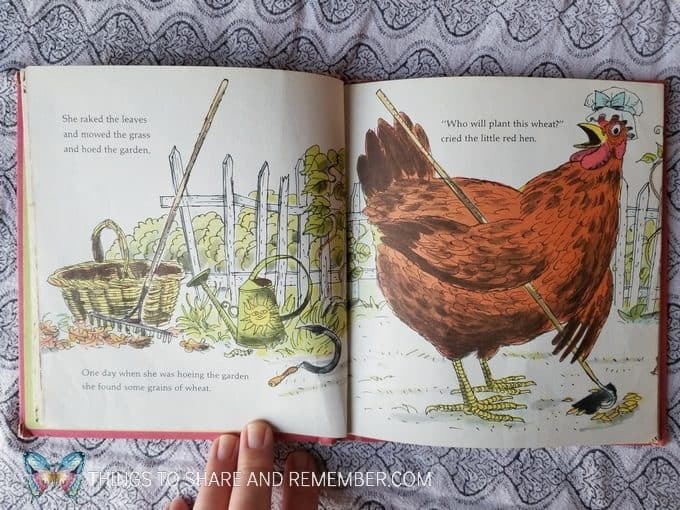 The repetition and lesson in it, besides the whole part of how the grain grows and becomes flour to make a cake makes this book perfect for preschoolers. 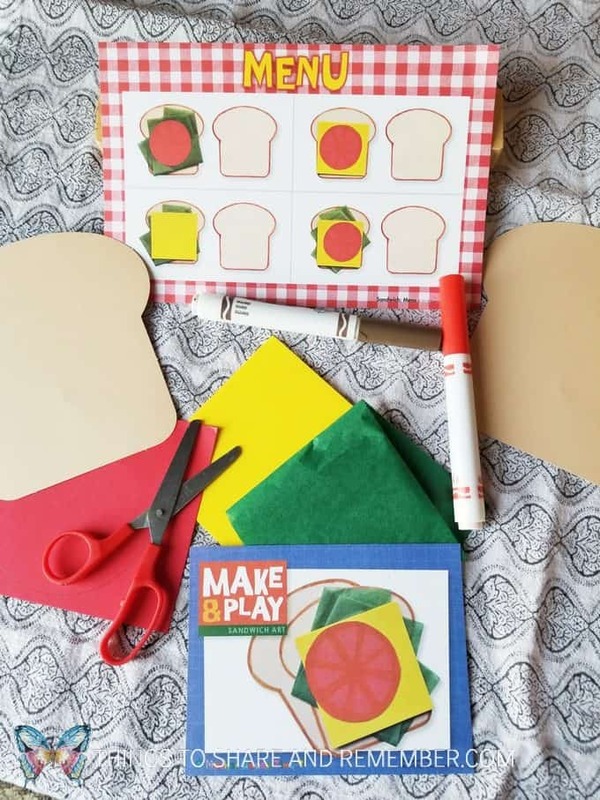 The Sandwich Art Make & Play couldn’t be any cuter! 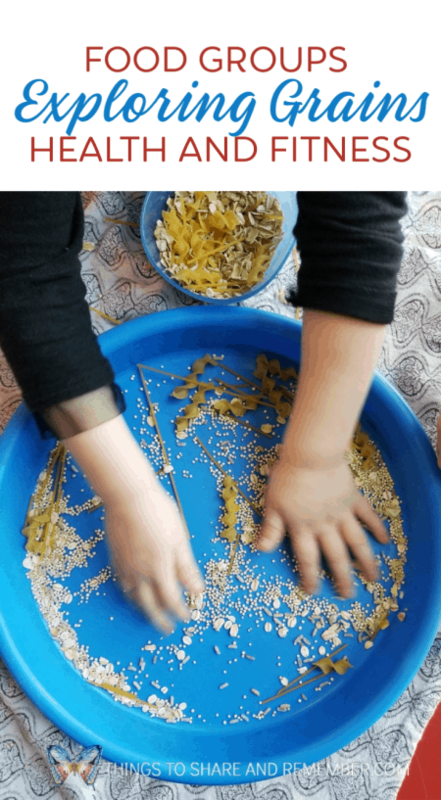 Everyone loved this activity, which didn’t necessarily include a lot of art depending on what the child wanted to do. Some colored their bread or outlined it like shown on the card. 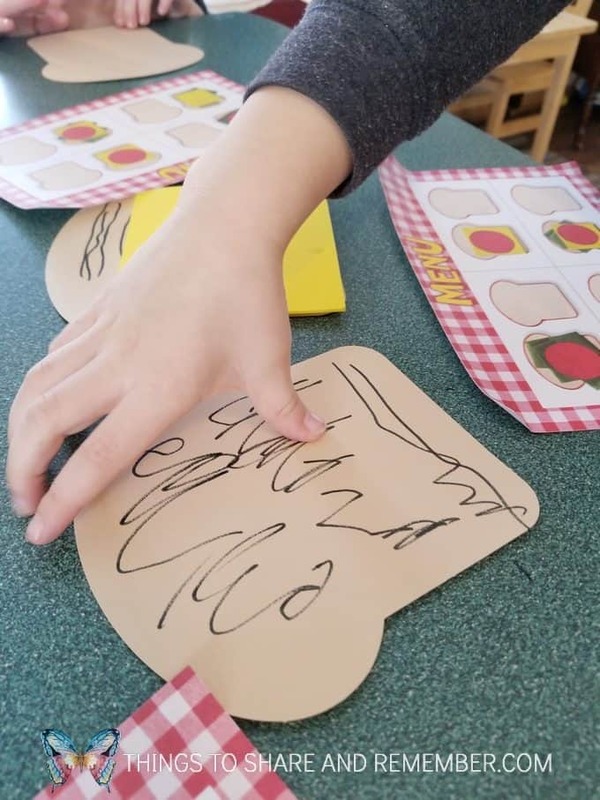 Some just cut out the tomato shape and practiced assembling their sandwich based on the menus. The yellow “cheese” is a piece of foam and the kids loved that! 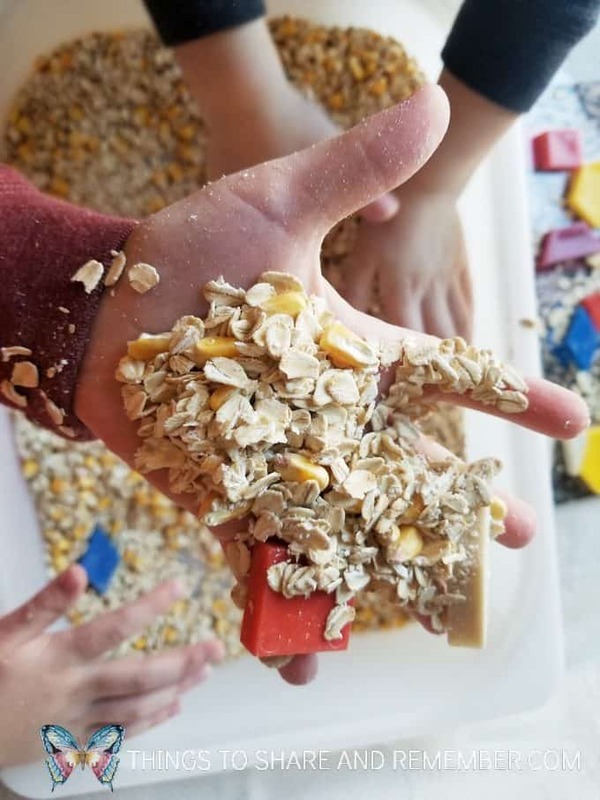 A fun STEAM Station for dramatic play involves some baking items and play dough along with some grains. 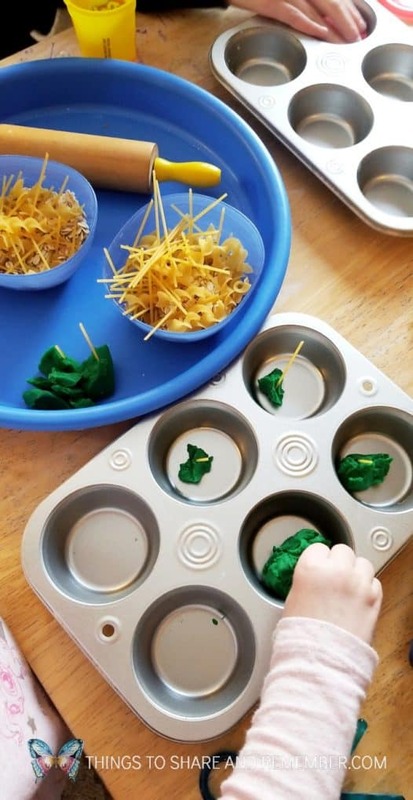 Set out a muffin tin (just a $1 at the Dollar Tree! 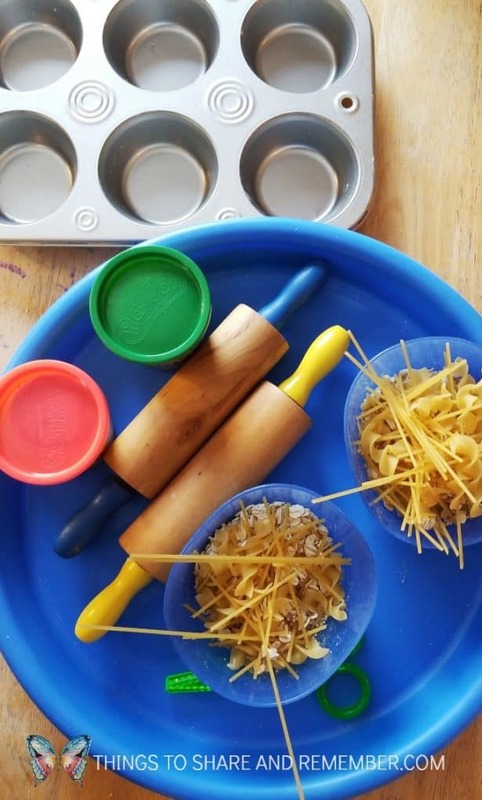 ), play dough, a rolling pin, some cookie cutters and some bowls of grains. Some pretended to make cakes or bread. One creation looked more like a sculpture than something to be eaten! 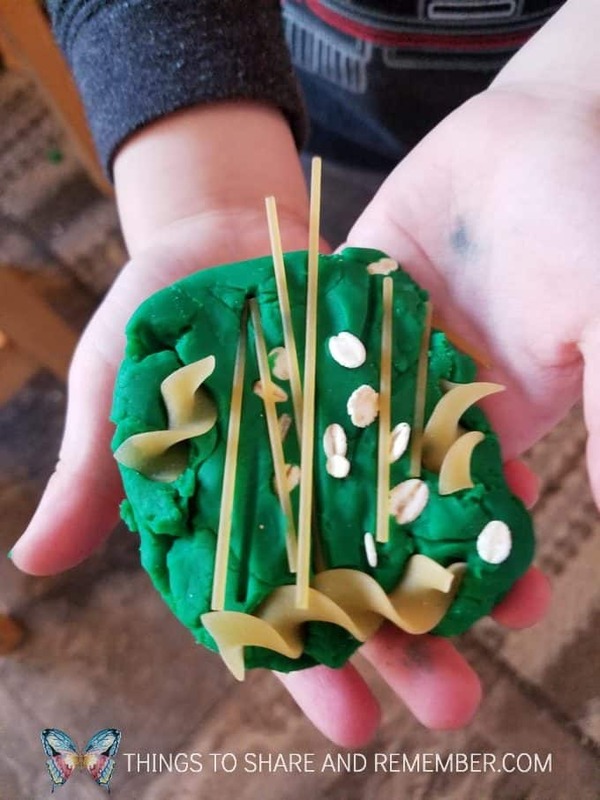 Playdough seems like a new activity with new accessories and allows for a different kind of imagination and play. 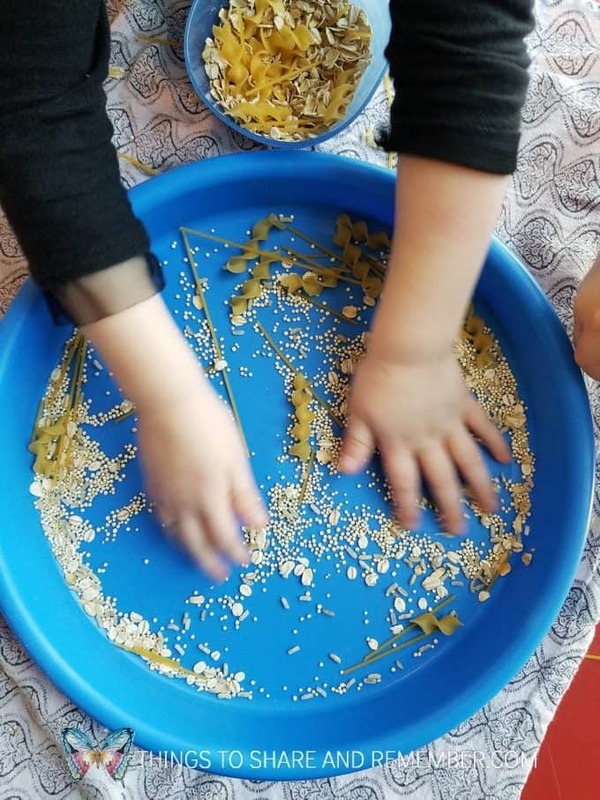 We had an amazing time with these exploring grains preschool activities! We’ll be learning lot more about health and fitness this month so check back!